SINISTER-LOOKING TRAX by Jim Corbran, Automotive Columnist Looking around it seems these days a lot of people like their vehicles the same way I like my coffee. Black. And it’s not just the paint jobs, but the trim and — maybe most importantly, the rims. The blacker the better. Years ago the only black rims you saw were the steelies which showed when your hubcaps fell off. Or were stolen. Nowadays you’d be hard-pressed to even find a car, except for the really low-end stuff, which has steelies. Chevy knows a trend when they see it, which brings us to the new Chevy Trax Midnight Edition. Based on the LTZ (top rung on the Trax trim ladder), the Midnight Edition adds the aforementioned black rims, bezels, beltline molding and door handles, and rear license plate applique. The seats are trimmed with gray accents and the floor mats feature gray piping. 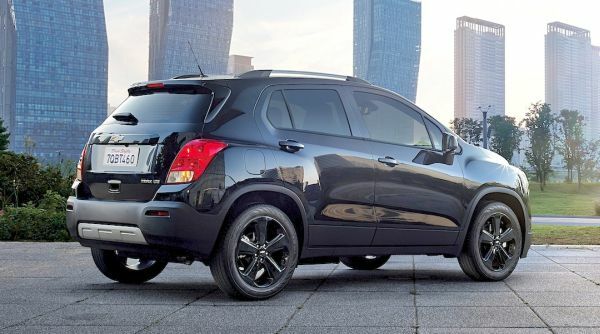 The Trax Midnight Edition will go on sale in February for $26,625. See more here: Chevy Tax Midnight Edition ### The post SINISTER-LOOKING TRAX appeared first on Buffalo Cars.